The prospect of hosting the 2016 Olympic Games was presented to the people of Rio de Janeiro as a chance to showcase the city to the world, generate investment, and improve the lives of its residents — but two recent events illustrate how the combination of construction for the games and a worsening housing crisis has prompted accusations that Olympic preparations are riding roughshod over Rio's most vulnerable inhabitants. On Tuesday, police evicted squatters from an abandoned apartment building that onetime Brazilian billionaire Eike Batista had leased from the Flamengo soccer club, hoping to convert it into a swanky hotel for the Olympics before the collapse of his oil and mining empire. Many of the roughly 300 unauthorized residents and their young children were already leaving after a judge ordered them to vacate the building, which had been empty for years, but confusion took hold as riot police charged in after a fire broke out. Clashes ensued, with squatters retaliating against officers by allegedly throwing rocks. Around a dozen people were injured and three were arrested — including an officer who was said to have fired pepper spray at a man carrying an infant. Rio's City Hall said it had provided 130 slots at a shelter on the western fringes of the metropolis, but residents declined the offer. "That shelter is out of the question: there's gunfire all night long, and it's full of crackheads," Stephanny Bernardes, one of the evicted squatters, told the Terra news portal. "We can't go there with our small children." 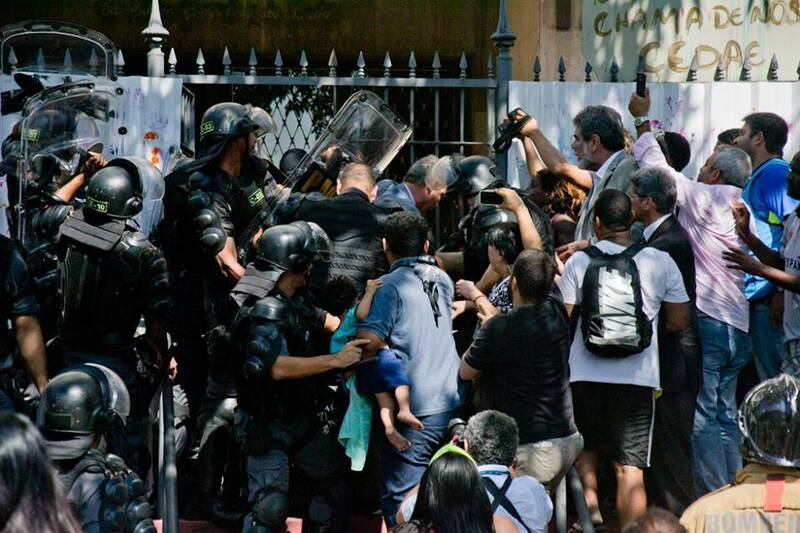 Marcelo Chalréo, president of the Brazilian Bar Association's human rights commission, attempted to fight the eviction order, and later said that the removal of the families simply shuffled the housing problem elsewhere. "No one is here because they want to be, but out of necessity," Chalréo told the Brazilian daily O Dia. "We're not seeing support from the local authorities in Rio, who should start treating this problem as a social issue, not a political one." As with last year's World Cup, during which thousands of homeless Brazilians formed encampments to highlight the severe housing shortfall, many affordable housing advocates are blaming the Olympics for pricing cariocas out of their own city. "When the state pacified the favelas, they were seen as safer and rents shot up, meaning many could no longer afford to live there," Guilherme Simões, national coordinator for the Homeless Workers' Movement, told VICE News, referring to the city's slum areas. "There are now around 800,000 families without a home in the Rio metropolitan area. Rio continues to persecute, demonize and criminalize the poorest in society, and it's getting worse. Many had to move out of the city, which now only serves those who can afford it." Simões described the cycle of squatters entering unused buildings, getting evicted, shuttling from shelter to shelter, and then moving into the next squat as never-ending. Related: Will Julian Assange Be Moving to a Squatters' Settlement in Brazil? The city's needy families and housing advocates are calling for the government to provide adequate accommodations within their community, rather than in marginal and sometimes dangerous neighborhoods. The insecurity and lack of services in those areas are common complaints. "When families are offered social housing, often it entails being uprooted from the areas they grew up in, severing family and community ties," Orlando Alves dos Santos Jr., professor of urban planning at the Federal University of Rio de Janeiro, told VICE News. "Many reject their new life and return, even it that means living on the streets." Even those who have homes aren't safe: reports emerged Wednesday that a bulldozer had begun razing the Vila União da Curicica favela near the Olympic Park in the west of Rio in order to make way for a bus rapid transit system connecting sporting venues, the main Olympic site in Barra da Tijuca, and the Deodoro sports complex in Rio's north zone. The city has a housing crisis, yet it is busy tearing down houses. Some of the displaced families are being rehoused, while others have been offered compensation. But members of demolished communities elsewhere have reported complications in receiving the promised compensation. Vila União thought it had survived threats of removal. City authorities said in December that they had scaled back their plans, with 181 households set to be evicted, but a recently released government document suggests that 304 families will lose their homes. Residents of the neighborhood had already seen 95 percent of the nearby Vila Autódromo community leveled to make way for Olympic infrastructure, which sparked a wave of protests that drew international attention. Rio Mayor Eduardo Paes said that the city had negotiated with the owners of the 760 dwellings that had been removed, and has pledged that the remaining residents can stay. Locals, however, report that they are being coerced into accepting compensation to leave. Santos is studying how the mega sporting events have informed the process of Rio's "metropolization"— the centralization of urban development as space within a city grows scarce. He notes that the number of families removed from Vila União could see the dispersal crowned the biggest Olympic eviction to date. "It's a huge lack of transparency on the government's part. They say one thing and do another," Santos said, adding that favelas are also being removed in desirable, high-value property areas to boost profits for developers. "The smoke screen of the Olympics is being used to justify further evictions." Local authorities deny they are evicting families without compensation, and have promised that the $12.4 billion they are spending on the games will help to improve and integrate Rio, leaving behind a grand "Olympic legacy." "The focus of these games will be a legacy of infrastructure left for Rio," Mayor Paes said last year, suggesting that 60 percent of the budget would come from private investment. "The Olympics are being done, above all, to change the lives of people of this city for the better." But Santos notes that the infrastructure projects being prioritized, such as the transit systems, are of little use to most Rio residents, while more pressing concerns, such as connecting poorer neighborhoods to the wastewater system, have fallen well behind schedule. "There's a bottomless pot of public money for these mega-events, which, in the end, are making the city far more expensive," he said. "Not just rent, which has seen the biggest impact, but food, transport… everything. The poorest are really suffering. These events are a step back." Rio has managed to delivered some structural improvements, including some affordable housing. Last week, President Dilma Rousseff officially opened 500 houses in the region as part of the Minha Casa Minha Vida ("My House My Life") social housing initiative for low-income families. Nevertheless, the wait list for the program is long, the need is dire, and the government's economic uncertainty has raised doubt that the initiative's next phase will go ahead. The squatters evicted on Tuesday hope that the authorities will provide the assistance they require. "That building belongs to Flamengo football club, they don't owe me anything," 58-year-old Celia Regina Cesáriotold GloboNews. "But the authorities do. I voted for them, and now they should look out for us."